Each year for Valentine's Day, I set a special table for the kids the night before. I don't put a lot of other decorations up around the house (I do admit to having a heart-filled shower curtain), but I like to surprise them with a festive tablescape on Valentine's Day morning. 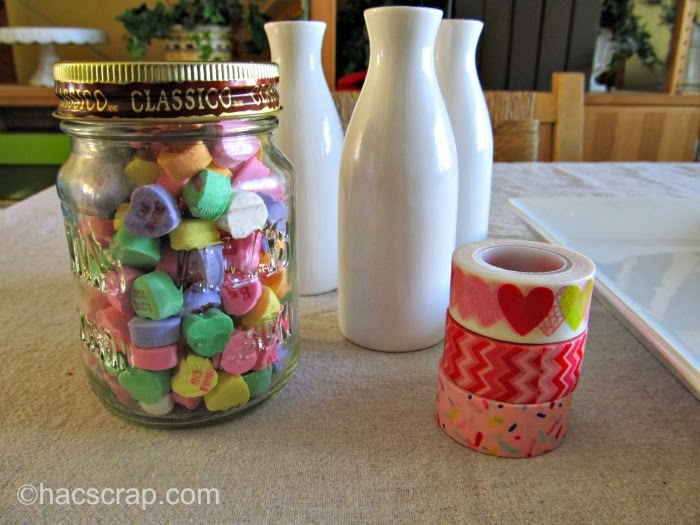 This year, while perusing Pinterest for Valentine's Day ideas, I got a flash to combine three of my current favorite things: milk bottles, washi tape and conversation hearts. I pulled out a plain white serving dish I picked up at Target and set to work to create an easy, fun and festive centerpiece. 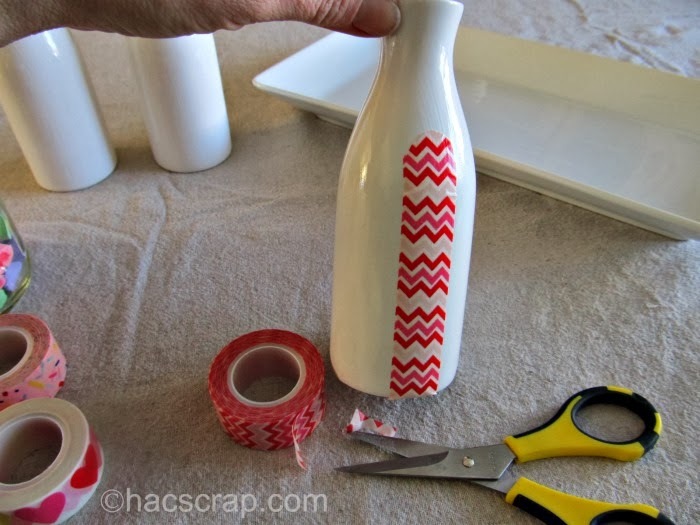 Decide on a pattern for your washi tape and adhere it to your bottles. I used scissors to make a rounded edge. Line up your bottles on your serving tray. 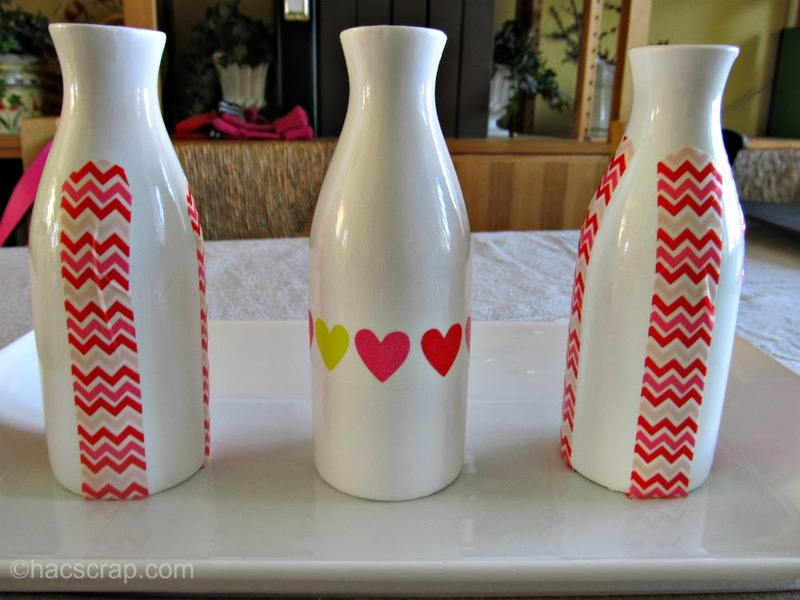 Sprinkle conversation hearts on the tray all around the bottles (don't eat too many). And that's it. In about a half-hour I had a fun and festive, easy-to-make Valentine's Day Centerpiece. If you didn't want to leave the hearts out, you could just put them out on Valentine's Day. Foil-wrapped chocolate hearts and kisses would look adorable too. This is ADORABLE!! 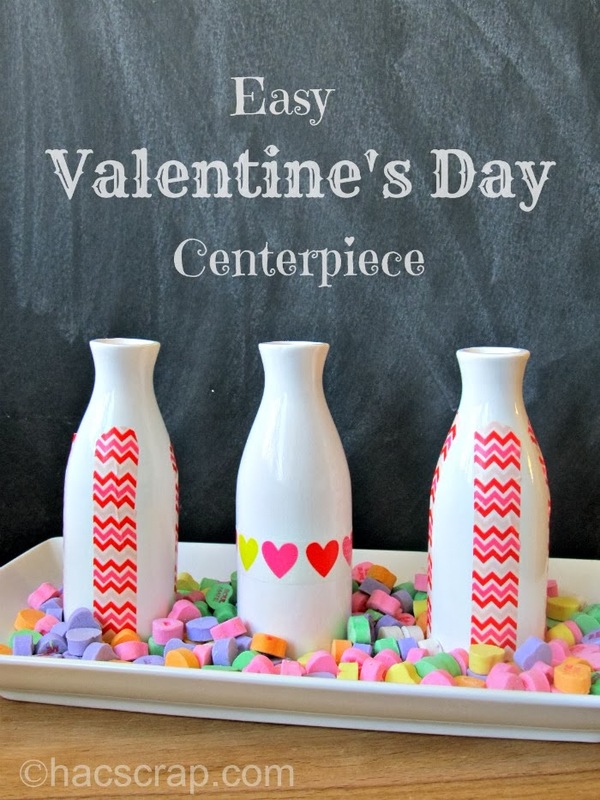 I usually throw conversation hearts in a vase with a candle and call it a day... but I LOVE this version and it's something ever a borderline crafty person such as myself can handle!! So easy that even I can do this one! I love those little candy hearts, but not to eat. I never thought to use them as filler. 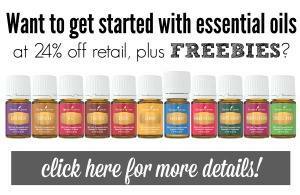 My girls will be all over this! They are all Washi tape all the time! OHHH. 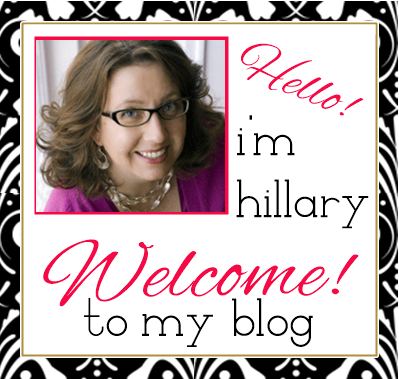 I love these Hillary! !